Next review Omega Xl - Made my pain WORSE! Refunds/returns are a joke!! Apr 08, 2016 Omega XL has hundreds of thousands of satisfied customers who continue to purchase our product monthly. There are thousands of testimonials to both our product quality and our customer service. As you have chosen to remain anonymous we are unable to review your account to be sure your automatic shipments have been cancelled and your refund issued. If you need to speak with us again we recommend calling our Customer Advocacy Group at 1-800-607-0419 or via email at cagsupport@greathealthworks.com. I am an 80-year old retired educator (High School Mathematics and Physics). On November 24, 2013, I caught a program featuring Larry King promoting OMEGA XL, and--willing to try the product in hopes of it alleviating my joint and bone discomfort--I became a subscriber. I've been taking that supplement for 6 weeks now, and--contrary to the sales pitch being made by Great Healthworks--my symptoms have become noticeably more painful. 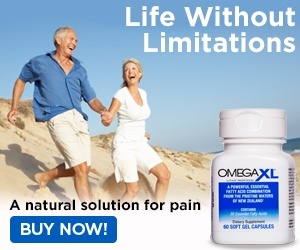 OMEGA XL is also causing aggravating constipation and intense abdominal pain. Although she came across as very courteous and very patient, the telephone sales representative employed by Great Healthworks, with whom I spoke on January 10th, would stop at nothing in an attempt to dissuade me from cancelling my order. Judging from the HARD SELL (though courteous) method being used by Great Healthworks, and judging further from the 24-30 minute wait time I was given when put on hold, it seems to me that Great Healthworks is being nothing short of disingenuous in marketing this product. I therefore encourage others who are in pain to carefully consider my own experience before you commit to this dietary supplement. Review #397800 is a subjective opinion of User397800. Unfortunatly very few actualy know this. Very sad. with time 2 myself 2 re-think it all through, I'll decide later what I am going 2 do. I have read the above complains and it seems to me that the product does not work the same for everyone. I tried Omega XL as well because they convinced me with the sells pitch, and I am so glad I did !! Prior to trying Omega XL I was taking "Mega Reds Joint pain" at a cost of $29.95 plus tax ( at Costco ). I am 65 years old and for the past year I began to experience upper neck pain. The Mega Reds helped but didn't completely take away the discomfort. Luckily I tried the Omega XL, and I am 90% better after 2 weeks !! So you see, everyone is not the same !!! You have to try it to see if it would help you. I figured , what do I have to lose but my pain !! You can't go by someone else's experience. A representative of Omega XL called me after 2 weeks to check on me, and I couldn't exclaim enough about how greatful I was for the product. I hope is not a temporary relief but for the time been I'll e using Omega XL. You certainly have got my attention! I just received my first shipment of Omega XL today and read all the material and took my first two capsules. BoY! I hope my story turns out like yours! After reading all the complaints I was a little worried. I decided to take just two caps for the first day and see if there was any reaction. That was 4 hours ago so far so good. I have disintegrating disks in neck and spine, osteoarthritis, COPD, A-Fib, Borderline Cholesterol reading, and am on digoxin and warfarin, and a low dose statin for cholesterol as a preventative that I would like to get off of! Hope their claim to no adverse interactions holds true or I will be swimming with the "fishes!" My doctor is having my INR checked every two weeks and blood work every 3 months...sure hope this stuff works! Like you said, Toasty, it is all relative to each individual. The first sign of something out of the ordinary and my doctor will be checking it out. I was on Omega Red Super Krill but it did not do much for me. I have to be very careful of the dose so that it does not interfere with my warfarin. A balancing act all the way, but hey! We will see what happens! Thanks for the hope and wishing you vibrant health and no pain! Sir, I would like to know how many gel caps were you taking per day, you failed to elaborate the dosage. Thank you high school math and physics educator (retired)! I am always very skeptical about online or tv ads. I thank you that you have submitted a truthful experience and with all my pain, I feel this product to not be worth the risk of the money they charge.